By Kelly Mostert, January 22, 2019 at 3:46 pm . 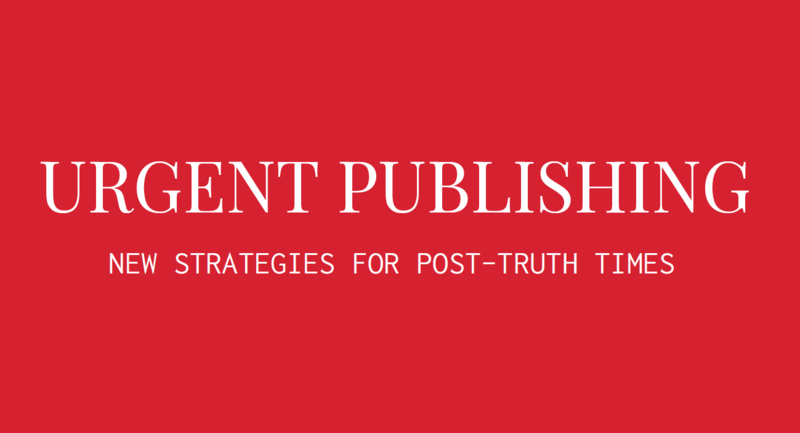 This spring we invite you to the digital publishing conference Urgent Publishing: New strategies for publishing in post-truth times organised on the 15th, 16th and 17th of May in Amsterdam and Arnhem. The Institute for Network Cultures (Amsterdam University of Applies Sciences), Willem de Kooning Academy (Rotterdam University of Applied Sciences) and the ArtEZ Press (ArtEZ Institute for the Arts) are joining forces to the urgent call for insightful, quickly produced and well-positioned publications in an era where fake news, pseudoscience and other fact free?features are broadcast to the world. Digital technologies have brought the printing press to the masses. Who gets to publish and when, the medium used and the channels through which information is consumed have all changed drastically. An ever accelerating development of emergent technologies has lead to a wide array of emergent publishing practices, be it in the form of longreads, vlogs, zines, collaborative platforms or print-on-demand – all the while leaving the status of and love for paper books in tact. A plethora of tools, applications, infrastructures, models, and hacks thus makes many futures of publishing possible. How to realize sustainable, high-quality alternatives within this domain of post-digital publishing? Liberation comes with its downsides: while the availability of publishing technologies have helped bring different voices onto the stage, connect new communities and identify hegemonic intersections of power, they have also played a role in bringing about what is known as the ‘post-truth era’. The scale and scope of once emergent publishing practices have exploded, leaving a disenchanted public to scavenge the rubble of breaking fake news stories, information pollution and broken links. Speed and availability of publications may have increased, but the quality of the information presented and of its containers lags behind. Publishers, writers, researchers, designers and developers need new strategies for urgent publishing. A critical set of discourses, practices and productions to intervene in the public debate with high-quality information that can be issued in a timely manner and that will reach the desired audiences. The development of such a toolbox of strategies has been the focus of diverse critical cultures that have interacted and experimented with publishing in the last two decades. Concentrated efforts directed towards furthering these practices within the context of the current information age will open up robust futures for a publishing domain that remains forever emergent – and urgent. Speakers will discuss publishing in a post-truth era: how to counter misinformation and stimulate open public discussions through a speedy publishing process, high quality content and spot-on positioning? We will have practical, hands-on workshops which will each focus on one of the strategies presented in the panels from the day before. A plenary session will be held at the end where we will recap the strategies and outcomes from the workshops. For students and professionals interested in publishing and design. What will a ticket cost?